Ole Georgurius Thrana had been a skilled stone carver and his work adorned [and still adorns] numerous buildings in Duluth. He was born in Steinkjer, Norway, November 9. 1872 . The name Thrana may have derived from a nearby hill called Thrana Bakken. Many people in Steinkjer took the name of Thrana from this hill. In the spring of 1889 he migrated from Norway to Duluth when he was only seventeen, a young lad to be taking such an extensive journey, especially when one realizes that he had no friends or relatives on this side of the ocean, but he did have a trade. He had learned the art of stone sculpture in his native Norway as an apprentice, a skill which prepared him for immediate employment upon his arrival in Duluth. Let us look at conditions in the city of Duluth in the 1890s when George Thrana began his career here as a stone sculptor, a career which spanned a period of forty years. Mining activity on the Mesabi Range was about to take off. Logging was in progress on the north shore, and on the Nemadji and St. Louis rivers, as well as the surrounding areas of St. Louis County and Carlton County. The sawmills in Duluth were to reach their greatest output during this decade and grain from the West was to pass through Duluth on its way to the lower lakes. This burgeoning of Business activity activated a mild population explosion, the result of which was a need for more schools, more residences, more office buildings, and more churches. From 1890 to 1895 Duluth had an increase in population of almost 30%—more than any other city or town in the state. This was the place to be for a young man with a skill related to building construction. Mr. Thrana arrived in Duluth at the time when the Endion School was being completed–too late for him to use his mallet and chisel on it. However, work on the First Presbyterian church, which was dedicated in 1891, was in progress, and his efforts adorn this beautiful classic Romanesque structure. Next, he was employed at carving decorative brownstone figures on old Central High School. This building was completed in 1892. From then on through the years until his last work, which was Stanbrook Hall and the Chapel at St. Scholastica was completed, he was very busy. Actually he was the only stone carver in the city of Duluth and one of very few in the state. His work involved travel to the Iron Range, the Twin Cities, as well as to the various stone yards in Duluth, Superior, and Sandstone. George Thrana’s carvings were usually made by mallet and chisel, especially on the softer stones such as sandstone. Harder stone such as granite and Bedford limestone and marble he resorted to pneumatic powered tools. He also sculptured in clay and modeled plaster from pre-formed molds. Such works were usually applied to ceilings, designs in relief such as we see in the Hotel Duluth. In the early 1900s there were two cut stone plants in Duluth, one in Superior and another in Sandstone, all of which were fabricating sandstone quarried at various pits on the south shore, at Fond du Lac or on the Kettle River. 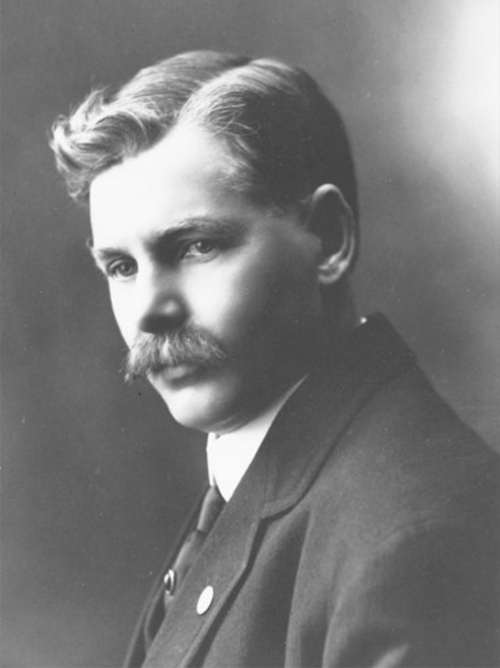 Chris E. Evans of Norwegian ancestry, former Duluth City Commissioner; operated the Duluth Cut Stone Company on the Lakeshore at 4th Avenue East, William Penn of Minneapolis operated a plant at 18th Avenue West and Railroad Street, also a large quarry employing as many as 50 men at Sandstone. D.O. Phinney of Superior had a plant at the foot of Tower Avenue. George Thrana did the artistic stone carving for all these firms. The actual tooling, shaping, and carving of the stone was done at the building site and involved working on scaffolding as well as on the ground. We find his work around entrances to buildings; or on a stone placed high on a wall of a building. Some carvings were of purely decorative design, others depicted the head of an Indian or animal and some represented classical and religious symbols. The figures were usually small and might easily be passed unnoticed. In fact while we were photographing at old Central High School we turned up carved objects which I had never noticed before although I had attended the school for four years! Some of his figures are life size, an example are the figures high over the entrance to the Chapel at the College of St. Scholastica. His work also includes a fountain in the yard of a Duluth residence [Glensheen, the Chester and Clara Congdon estate]. He worked on the interior of buildings as well. The decorative ceiling designs in relief at the Hotel Duluth I have already mentioned. The façades of fireplaces in many Duluth homes were decorated with his work. One encounters block relief carvings in the halls of Denfeld High School as well as numerous carvings on the exterior decoration. What was George Thrana like as a person? His son Sigvold states that his presence has impressive being six feet tall and with hair that had grayed prematurely. He had a kindly nature and was devoted to his family. Evidently he possessed a fine voice for he was one of founders of the Normanna Male Chorus and served as its president in 1913. In 1914 this chorus went on tour and gave concerts in their native Norway. George Thrana died in the spring of 1939 at the age of 67—the many years of exposure to stone dust had taken its toll. The cause of death was silicosis, commonly known as “dust on the lung” or “Stone Cutter’s Disease.” The prevent of this disease is now practiced routinely by stone cutters, but in his day it was not known to be a health hazard and few, if any, precautions were taken to shield workers from the dust and such was the case with George Thrana. He was survived by three children, Alf Einer Thrana now deceased, Sigvold Byarne Thrana now retired and living on Lake Millicent at Iron River, and Gudrun Thrana Olsen, deceased, who was for many years organist and choir director at First Lutheran Church. She also played the organ in the Duluth Theater. George Thrana had a talent which was needed in Duluth in his time. His work added an element of beauty to many of our buildings which our future generations can enjoy. The preceding was written by William D. Coventry, M.D. Presented at a meeting of the St. Louis County Historical Society at St. Paul’s Episcopal Church, March 18, 1980.